Fruity terpene profiles are commonly associated with Sativa-leaning strains and its stimulating head high. Watermelon Kush is an exception to this recurring theme. 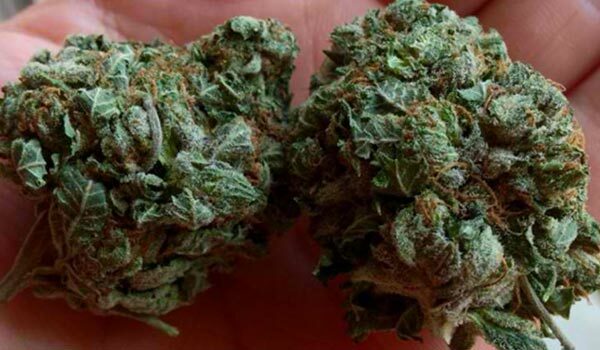 It is 80% Indica that blankets the whole body in deep relaxation but is equally delicious. Its name alone introduces users to its dominant tropical-themed terpene profile of blended watermelon, berries, and strawberries that, when combusted and consumed, fills the mouth with a fruity smoke that delivers an enticing head-to-toe high. Of course, that is only to be expected when one sees Watermelon Kush’s buds. Each are large, dense, and shiny as a thick layer of trichomes coat the nugs, which hint at its high potency. In fact, its THC levels average between 18% to 20%. As expected of a strain named Watermelon Kush, it has a powerful tropical profile. Its scents and flavors are predominantly sweet and ripe watermelon. However, when combusted and consumed, it is complemented by the taste of berries blended with honey. On the exhale, it leaves a fruity aftertaste reminiscent of strawberries. Watermelon Kush should always be used in moderation. As alluded to earlier, it is a potent strain that leans toward Indica. Because of this, smoking beyond individual tolerance results in a heavy-hitting body high with the potential to lock users to the couch. By staying within one’s limits, users are assured of a pleasant psychedelic high that gently stimulates the mind with a rush of euphoria. It clears away negative thoughts and instills a sense of happiness in its place. One of the best times to use Watermelon Kush is right before a meal. After all, though subtle, its mood-uplifting head high extends to the stomach as a stimulating buzz that ups the appetite. Having food nearby is convenient as the upcoming Indica high can sometimes prevent the body from moving around. After about an hour or two, a heaviness plants itself in the limbs. It starts in the temples as a light pressure that oozes down to the rest of the body in slow, sweeping waves that knead the muscles into relaxation. In all likelihood, users will want to lounge on the couch or laze around on the bed. Gradually, as two or three more hours pass, it becomes difficult to stay alert. The eyes begin to droop until users have no choice but to fall asleep. Dry eyes and mouths are common experiences when it comes to smoking Watermelon Kush. Both are mild and often go away after a few hours but, if symptoms persist, users may down a few glasses of water throughout the day. Avoiding alcoholic or caffeinated drinks will also keep the dryness from exacerbating. A more uncommon side effect with the bud is dizziness and paranoia, which are usually brought about by overconsumption. Most of the time, though, it is limited to a headache. Still, users should be wary about the pace and dosage of each session. Presumably, Watermelon Kush is a recreational strain that provides users with a head to toe psychoactive high. However, the same cannabinoids also provide users with a reprieve against various afflictions. Its happy high, for instance, clears the mind of unnecessary worry while uplifting the mood. It stabilizes emotions and slow down the fast-paced worries brought about by stress and anxiety. Because of this, it works well as a stress reliever and as an anti-depressant that manages symptoms of mental health issues like depression and PTSD. In subtly invigorating the mind, it also stimulates the appetite. Before anything else, however, it first soothes stomach cramps that prevent users from enjoying a meal. It is a source of comfort to patients dealing with eating disorders like anorexia and cachexia. Apart from the gastrointestinal tract, Watermelon Kush’s analgesic properties also release the body from pain. It relaxes users beginning from the temples before moving through the muscles and calming each limb. Later, as the heaviness continues, users gradually begin to slip into a state of drowsiness. It tucks users to bed in a deep, unencumbered sleep that improves energy levels for the next day due to its sedating properties. Watermelon Kush’s growth profile largely leans toward Indica. It is compact, short, and covered densely in foliage. It is also quite sturdy, having the ability to withstand strong winds and resist the cold. Because of this, it is a great strain for beginners looking for a fruity strain to grow in the northern hemisphere. In spite of this, it still requires a little bit of upkeep. It needs protection against harsh weather like heavy rains and frost which can stunt its growth or, worse yet, kill it. Investing in a temporary enclosing is highly recommended as it will not only keep the plants safe, but also circulate warmth. Flowers usually manifest around the last week of September to the middle of October. Growers can expect each plant to produce at least 450 grams of buds at harvest. Pruning is essential for successful cultivation indoors. Its compact structure as well as dense foliage can sometimes inhibit light and air circulation in the lower nodes. This can lead to humidity-related problems like mold, mildew, or bud and root rot which prevent the strain from growing properly. The Sea of Green method works best with Watermelon Kush. It takes advantage of its compact structure and short height to maximize space inside the growing room. Growers can usually place at least plants inside a square meter to encourage bud production. It performs even better when it is paired with a hydroponics setup, which delivers nutrients directly to the roots. However, for terpene enthusiasts, the best medium to use is soil. After flowering for about 7 to 9 weeks, growers can reap as much as 400 to 450 grams per square meter at harvest. Have you grown or used the Watermelon Kush strain? If not, would you like to get your hands on this strain? Please leave a comment to let us know what you think. We want to hear from you.